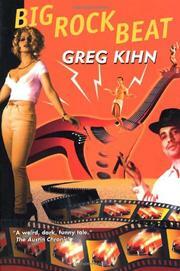 The sequel to Kihn’s 1996 debut novel, Horror Show, a satirical romp based on the film Ed Wood, which was followed by his Banshee novel Shade of Pale (1997). The hero of Horror Show was schlockmeister Landis Woodley (Ed Wood), the world’s worst filmmaker, who brought in his masterpiece, Cadaver, in three days and under budget, using real corpses from the Los Angeles Morgue as standup zombies. Now, ten years have passed since Cadaver, with Landis pining away in his crumbling Hollywood mansion. It’s 1967, the summer of love, and Landis’s old producer buddy Sol Kravitz shows up to lure him into directing a rock-bottom schlock musical on an atomically small budget. Kravitz has fallen in with Ernie Shackleford, president of Shang-a-Lang records, who wants to feature his talentless rock bands in the movie. The film’s star is aging Yvette Love, whose z-cup bra outbusts Jayne Mansfield, Mamie Van Doren, and Marilyn Monroe combined. Second leads go to Gayle Mimi (formerly Gayle Ann Perko), making her film debut, and overaged teenager Tad Kingston, 31, whose hair does most of his acting. No sooner does Landis sign on than Hiroshi Watanabe (a name taken from Kurosawa’s Ikiru) offers him a much grander salary for doing a monster movie for Toyo films in Japan. Meanwhile, fresh from San Francisco is Landis’s cousin, very long-haired Beau Young, whose Stone Savages rehearse on San Francisco’s Haight Ashbury. Thus Beau and the Stone Savages join the fun and frenzy. Beau courts Gayle but is seduced by Yvette. The money falls through, and Sol winds up dead in the flame-painted Porsche Spyder that James Dean also died in and which is to be featured in the film. Landis must take off for Japan. Lovers of rock music will find this almost as much fun as the prequel—though less fantastically over the top—or fresh.